The proliferation of electronic devices and the growing need to process large amounts of data are among the reasons why the world needs to marshal its energy resources wisely. Add to that the obsolescence of our conventional electrical grid, the emerging Internet of Things and the call to bring essential human requirements — such as light and agriculture — into the 21st century. Underlying those new technologies and energy-saving efforts is gallium nitride (GaN), a compound with unique and valuable electronic properties. UC Santa Barbara electrical and computer engineering professor Umesh Mishra anticipated the need for higher performance and energy efficiency a long time ago. For decades he has focused his research primarily on the development of GaN materials and devices for electronics while contributing to opto-electronics such as optical data storage, semiconductor lasers and — last but not least — white LEDs pioneered by UCSB professor Shuji Nakamura, which have revolutionized lighting throughout the world. Due in part to Mishra's efforts, GaN has now become the cornerstone for advanced, energy-efficient technologies including power electronics and RF electronics for radar and 4G and 5G communications. On Monday, Nov. 26, Mishra will deliver the 63rd Annual Faculty Research Lecture, the highest honor bestowed upon UC Santa Barbara professors in recognition of extraordinary scholarly distinction. The event at Corwin Pavilion, which is free and open to the public, begins with a reception at 4 p.m., followed by the lecture at 5:15 p.m. Titled “Thank God for GaN,” Mishra’s lecture outlines the power of GaN to not only drive innovation but also to modernize existing technology, reduce power consumption and limit energy waste. 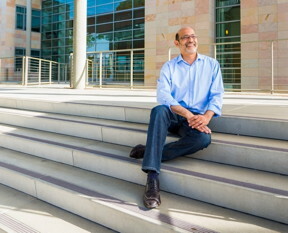 The Donald W. Whittier Professor of Electrical and Computer Engineering at UC Santa Barbara, Mishra joined the faculty in 1990 after an early career spent both in industry and in academia. He received his bachelor of technology degree from the Indian Institute of Technology in Kanpur, India, his master’s degree from Lehigh University in Bethlehem, Penn., and his Ph.D. from Cornell University. A highly cited researcher, Mishra has put his considerable talent into the industry of GaN as well. In 1996, he co-founded Nitres (later acquired by Cree, Inc.), the first startup in the world to commercialize radio frequency GaN transistors and LEDs. In 2007 he co-founded and continues to lead Transphorm, which has commercialized GaN-on-silicon transistors for power conversion. Known for his engaging teaching style, Mishra has supervised more than 65 Ph.D. theses — more than 40 of them in the field of GaN materials and devices. Many of his students have won awards for their presentations at prestigious conferences and have gone on to become leaders in the field in their own right. Mishra has received numerous honors, including the Institute of Electrical and Electronics Engineers’ Microwave Theory and Techniques Distinguished Educator Award and its David Sarnoff Award. He also has been awarded the International Symposium on Compound Semiconductors’ (ISCS) Heinrich Welker Medal, as well as the ISCS Quantum Device Award for his contributions to the development and commercialization of GaN electronics. He is an IEEE Fellow, an International Fellow of the Japanese Society of Applied Physics, a fellow of the National Academy of Inventors and a member of the National Academy of Engineering.